How MyAnalytics nudged me to make my time, mine! Roundabout 3 years back, I was about a year into a new job that was intense, exciting yet in some ways deenergizing. I say deenergizing, because inspite of having packed days doing important and impactful stuff towards making our organization stronger, I was going to bed at night with a lot on my mind and ideas, that I didn’t have the time to think about. I was in a new country, trying to absorb everything the new experience and the job threw at me and inspite of doing a lot I was left feeling : still so much to do, but where’s the time? Time was increasingly becoming a defining factor of the unease. I realized, clearly the #3 was hurting me immensely. Motivation happens to different people differently. To me intrinsic components of feeding my curiosity, learning and creativity (of exploring new ideas to build solutions) has always been a key motivating factor . And my inability to do so was contributing to the prevailing unease. In their popular book Nudge – Improving Decisions about Health, Wealth and Happiness (2008), Richard Thaler and Cass Sunstein suggested that if a particular unfortunate behavioral or decision making pattern is the result of cognitive boundaries, biases, or habits, this pattern may be “nudged” toward a better option by integrating insights about the very same kind of boundaries, biases, and habits into the choice architecture surrounding the behavior – i.e. the physical, social, and psychological aspects of the contexts that influence and in which our choices take place – in ways that promote a more preferred behavior rather than obstruct it. While these modifications were minute ones (no rocket science there), the impact was significant. I could immediately feel a reduction in clutter, helping me shift my share of time from transactions to transformation, which was more impactful both for the organization and self. Also, these were just starters to further modifications that I would go onto make ahead, to gain more control over my time. “…you control your time. And sitting and thinking may be a much higher priority …. It’s not a proxy of your seriousness, that you’ve filled every minute of it…. ”. A massive insight gained, an important lesson learnt, and an essential behavior shift activated to gain more control over my time and create more energy for myself. All triggered by that little nudge from MyAnalytics! The question (and the preceding discussion) was about Microsoft Teams and came from one of our customers during a recent customer engagement conversation. It’s a valid question, one that we hear practically every day – not only from our customers but also from our internal teams. Why shift from something, when it really works? Technically there are several reasons that underscore the merits of this transition – collaboration, aggregation of all productivity capabilities in one application, security, quality of interface, creating more time etc. Yet, as I stood there thinking on how to respond, my mind was racing to find a simpler narrative to make this argument plausible. Our emails are like meeting rooms (A). Over time information, notes, insights, files, content etc. reside in these rooms (mails) or in separate rooms/vaults (C) (our own computers or externally in shared storage spaces – SharePoint, OneDrive, OneNote etc.). Similarly, our chats and calls are independent activities, and insights or decisions created in those either do not get saved or stored as above. Our organization today is all about multiple project teams, workgroups, cohorts etc., who need to operate within a closed inner loop. Within this loop, to search for information, notes or files (that were shared), entails searching through all these multiple rooms and vaults (either by physically opening each of them or by using some sort of search command), which either results in higher email time or repetitive efforts to reshare information. Imagine physically running through each of the rooms and rummaging through all the stuff kept in each of them to figure out the right stuff that we need for use. It’s pretty much like that experience. Also, if a new member has to be inducted into the project midway, imagine the complexity involved – one has to find all the relevant material from respective rooms or vaults or calendars or notes to share with them as individual files or links for them to get up to speed. Needless to say, security across can be a complex subject when the project is sensitive. So, now searching for anything is to just a search within this one big room – simpler, easier, cleaner and less time consuming. The idea of this virtual all-inclusive Collab-Lab that empowered teams with more productivity and time, seem to resonate deeply with the customer team. The modern workplace or “new world of work” as we have come to know it as, is all about creating time for doing more with our lives. The real power of technology will be measured with how much it helps us do with our time. Microsoft Teams is right up there in empowering us to achieve more. The submarine experience wasn’t a great one from a sighting experience view, but the knowledge of being at a 120 ft depth, did create a mild flutter in the tummy! There isn’t any dearth of cinematic vistas in this land..
Its incredibly fascinating to know that the Whales (females) travel all the way from Alaska to Hawaii waters to give birth and to strengthen their new born for the life ahead. Males, well they just tag along to be a pain at the wrong place and to create a lot of commotion. Basking in the Sun was probably the most sought after activity for us …trying to thaw ourselves! One of the most recommended restaurant experiences is at Merriman’s, Kapalua. Located at one of most picturesque tips of the island, a good table can promise a breath taking view of the ocean, sun set and (if lucky) whales. The trick is to be there as early as possible (we booked a 4:30 pm table, and landed there at 4:15pm) – amazing Taro cakes, Monchong and Moscato! The early dinner booking was worth every penny ! And when Patriots and Chiefs take their battle into extra time… a lot of folks stay put in their room glued to their TVs, munching on the last bits of their nails..
One of the many things that my wife inspires me in life is her passionate pursuit to live an environment friendly life and one of her regular practices is – Carrying cloth bags every time we step out of home, irrespective of whether we are planning any shopping or not. The bags are always neatly folded (pic) in one corner of her canvas handbag (she doesn’t use leather). This dogged pursuit started some years back and she has been religious in keeping upto it. Those few stray occasions when she did forget carrying them and we ended up buying something (or the restaurant packed the left over for take out in a plastic bag), her disappointment was strong and prominently evident. I write this today because I just saw Royal Statistical Society’s winner of the most attention grabbing statistics of 2018, as part of their annual awards. 90.5% of all the plastic that’s ever been produced has never been recycled. Mass production of plastic got underway around 60 years ago and since then around 6.3 billion metric tonnes of plastic waste has been generated. Of this, 12% of it is incinerated, with the rest ending up in landfill sites, as litter, or polluting the oceans. The 6.3bn metric tonnes of plastic waste is equivalent to about 7.2 trillion grocery bags of plastic, which – if stacked on top of one another – would be enough to reach all the way to the Moon and back 5,790 times. And if each of those bags contained just $1 worth of plastic, that’s an astonishing $7.2 trillion worth of plastic going to waste. And that, according to one of the judges of the International Statistic of the Year, Prof Liberty Vittert , is enough money to buy Apple, Amazon, Google, Microsoft, Walmart, Exxon, GM, AT&T, Facebook, Bank of America, Visa, Intel, Home Depot, HSBC, Boeing, Citigroup, Anheuser-Busch, all the US National Football League teams, all the Major League Baseball teams, and all the English Premier League football teams. I have been guilty of having cringed on several occasions when she took those bags out, but deep down truly appreciated her tenacity to pursue this important effort (to the best of her ability). The above statistic only takes my appreciation and respect to another level. The present day workplace is changing at a rapid pace. The traditional set up of a few years back that comprised of a set of organized and structured physical work area routines along with the well laid out organization interaction and process norms, have become archaic. In some cases, even ceased to exist. In its place, is rapidly emerging a workplace structure that is everything but structure. With bombardment of information and ideas from all directions, an external marketplace that is evolving at an unthinkable pace and most importantly a workforce that is energized with chaos and clutter, the key values that are revered today are agility, nimbleness, adaptability, multi-dimensional etc. How does Leadership operate in these times? After all many leaders (at least majority), belong to an structured era of the past – that was structured, organized, hierarchical, orderly and are desperately trying to cope up with the new era. How do they stay relevant? Not judge the new era from a distance. Dive in. Seek help and internalize: The way of this new era is that of being continuously alive to multiple dimensions at any point of time. The millennials (the key players of this era) like more energy, conversations, ideas, collaborative environment, doing more. When all of this happen at the same time, it may look immensely disorganized and disoriented to leaders (or anyone who likes a bit of planning and order). While the urge to bring in a more organized way of doing things would be high, the advisable approach would be to learn the new way. Understand how the new flock do things. Roll up their sleeves and participate in conversations (as much as possible). Listen and observe intently to figure out what’s going on. Appoint mentors from the new generation to help decipher their thinking and ideologies. Embrace Technology: This is oxygen. The world is driven by technology (Devices, apps etc.). More and more technology seeping in at an unthinkable pace into our workplace to make our lives more connected, collaborative and portable. Apathy for technology will only affect one’s personal brand adversely, as that will carry the risk of the leader being perceived as a derailer or roadblock to the Future of the Workplace. With the world moving towards the cloud & mobility, it’s imperative for leaders to be proactive in understanding and learning how their worlds will change. While being tech savvy wasn’t a “must have” till some years back, it is so now. Being Social: Let’s face it. Social ecosystem is here to stay. While it was just another place to showcase oneself till sometime back, now it’s the space to create global communities to accelerate learning, business, collective intelligence and collaborative thinking. For today’s workforce, it as mandatory to be on top of what’s happening around the word in their domain, real time. These ideas and information, seamlessly flow into conversations and aid the collective intelligence Leaders who aren’t aligned to this world, find it (or may find it), difficult (and intimidating, at times) to comprehend the energy and context. On the contrary, a more socially active leader, has the advantage of not only being aligned to this world, but also being a proponent to the new age thinking. It does create an inspired climate. Being patient and tolerant: In my experience, I find a lot of leaders being restless trying to cope with the pace, the multi-dimensional thinking, the seemingly disorganized way of operations, the constant buzz of conversations, the seemingly lack of focus and deep thinking moments. It is and will be challenging. It’s a transformation – more of an adaptive one, where leaders have to almost discard their existing core and build another one. While the primary accountability of the leadership still remains the same – making critical strategic decisions, the environment surrounding it has changed. It will require a lot of patience and tolerance, to adapt to this changed world that may not align to one’s personal beliefs. For example: Simple transformative instances of adjusting to modern open and flexible workplaces, or getting used to people doing multiple things during meetings over multiple devices (responding to mails, tweeting, etc. ), or warming up to meeting conversations with a flurry of energetic and fast paced ideas being thrown,… can be demanding for leaders who are used to having an agenda and an organized routine to their meetings. Instead of thrusting order, the key will be to embrace the chaos – with patience and tolerance. Ask & Listen: This is an era of conversations. Leaders need to be conversation creators, providing opportunities for the energetic minds buzzing with ideas to constantly express their thoughts. This isn’t a generation that will warm up to the “one-way tell and direct” style. This is an era where hacking is the way to do things – pose a question, let the minds around storm and hack a solution. A leader’s role is to Ask the most relevant and pertinent question (or pose the most burning problem), and allow the system to work on it. It will be critical for the leaders to push themselves into suspending their POV’s and ideas, and patiently listen to the multitudes of thoughts and solutions. It will be critical to divorce the “it doesn’t work that way” mindset. This will be the single biggest trait of a leader that can energize, inspire and galvanize a modern organization to do unthinkable stuff. The modern day workplace or as T.A.McCann, founder of gist.com puts it in this short video, the Future of the Workplace is a fascinating evolving landscape. Concepts like multiple jobs across a working lifetime, having fun @ work, work life balance no longer there, retirement would no longer exist, do your best effort at all times, connecting and reaching out to others who share a common passion on a particular topic / goal with you, learning as a key driver of working together effectively, etc. etc. would be helping redefine how we view AND live our workplace(s). And all of that thanks to the emergence of culture, tools and technologies within the enterprise and beyond! Leaders must be at the forefront to enable this change. As McCann puts it – the future of work is Learning and doing something for someone else and not for oneself alone. Onus lies with the leaders to role model that. Cheers! Recently I was speaking to a leader and discussing her feedback style. She was highly self-critical as she reflected on the same. Off late, she had been getting into too many conflict situations amounting to her feedback being rejected. As we spoke, we went over a few instances and she replayed the mental video tapes of those. While listening I noted that she used expressions like “you were rude”, “what’s wrong with you”, “you need be show more technical depth”, “you never talk on calls”, “You have been a poor role model of being punctual to meetings” etc.… to surface all that was wrong. What followed these expressions were a bunch of refutations or negations, from the other end, as the recipients expressed their vehement disagreements. Majority of these conversations weren’t leading to any constructive result and ended adding to the increasingly deteriorating team dynamics and diminishing leadership credibility woes. As we sat reflecting over this situation at hand, I scribbled a diagram (being the visual person I am) on the board to depict the visual depiction of the conversation. 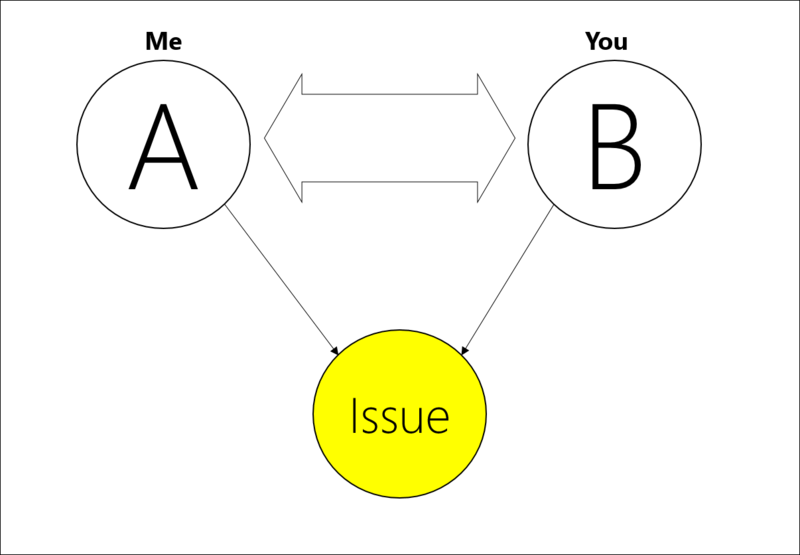 The diagram showed that the information flow was between A (feedback giver) to B (recipient), with A identifying B as the issue – the overt use of the term “you” in the above statements. While from A’s Point of view, she has expressed her displeasure clearly, from B’s point of view, what’s coming is a barrage of personal attacks. And true to human psyche when there’s an attack there needs to be a defense. Thus, the refutations and negations. This mental model, certainly doesn’t create a safe climate of reflecting over a developmental opportunity and operates one the foundation of A trying let their steam off on B (B is the issue). As we discussed more on how we can approach it differently and make the environment safe, I made a slight change to the above diagram by adding a third circle C.
The diagram shows a third circle – the Issue. So in this state both A and B stand together on one side of the table and look at the issue with the same lens. So instead of a statement like “You have been a poor role model of being punctual…” it may sound like “last 4 meetings/calls there was a delay in your joining in. How can we ensure you are there on time?”. Majority of the feedback that happens, isn’t one as there isn’t anything being fed. Most of the time the “giver” ends up expressing their dissatisfaction or anger (thinking they are delivering a feedback). A slight shift in the mental model and preparing the right language that separates issue from the person, can go a long way in boosting an inspiring culture of learning, listening and being respectful.